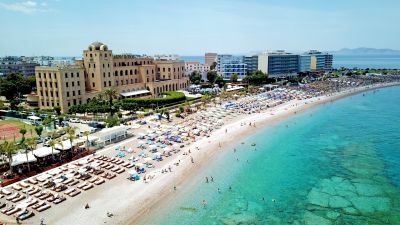 Kallithea is situated against a setting of stunning beaches and world famous spa baths, on the eastern coast of Rhodes, 2 kilometres off the lively resort of Faliraki. Kallithea is relatively quiet: still, it offers the visitor an extraordinary amount of entertainment choices. 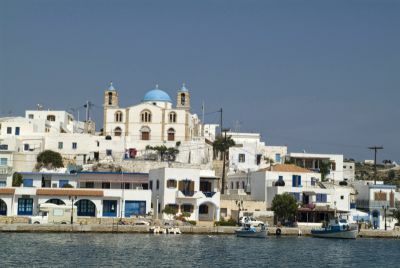 The beaches, bays, coves and caves, where many locals like to gather, offer something for each member of the family. The beaches are well organized and offer cafes, canteens, restaurants, and umbrellas. The tiny inlets and coves with their sculptured rocks and caves offer endless exploratory promise to all youngsters, and for the more adventurous, daily underwater diving trips can be arranged. 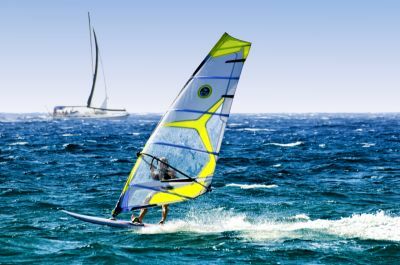 Water sports are on offer too, but should you wish to lie back and relax, a more perfect spot would be hard to find. 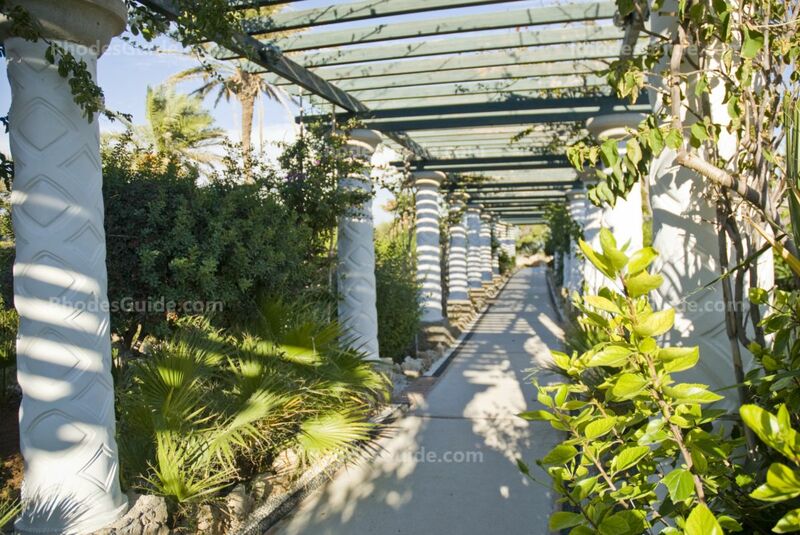 Kallithea Spa was built in 1920 by the Italians during their rule of the island. 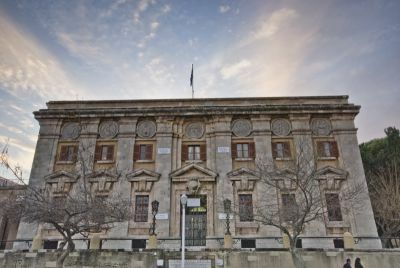 It is said that Hippocrates, father of all physicians, drank and recommended the healing qualities of Kallithea waters, and that was back in 460BC. There were many followers of this type of healing and the waters are said to have helped those with stomach troubles. Today the domed pavilions and archways have been renovated and although the waters have long-since dried up, many people visit the area for its crystal clear sea waters and magical scenery. A restaurants & cafes are available and inside the rotunda an art gallery is organised by the local Municipality. Wedding receptions are often hosted here just as there are conferences and events. Walking through the gardens one can touch and smell the various herbs and spices planted along the paths, giving off a particularly strong aroma. Once you have visited the Baths, drive on towards Faliraki and take the first dirt track to the left. 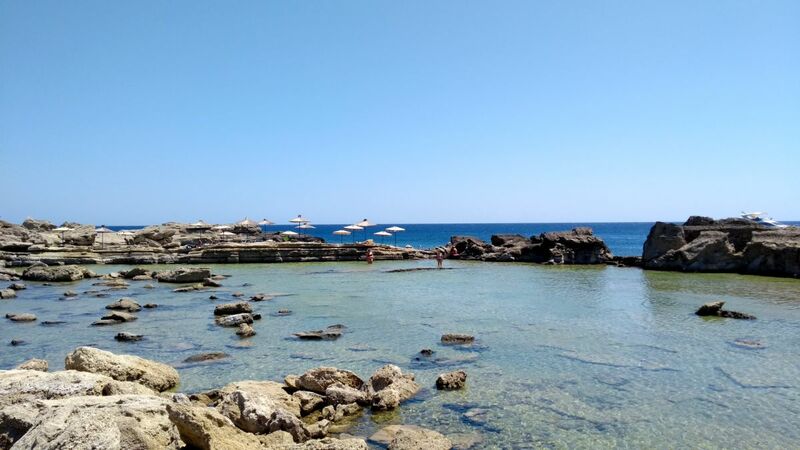 Then, by following the signs guiding you to the various small eating places in the area, you will reach a series of pine-covered bays and coves, with stone pools and rocks you can dive from (be careful: the sea is deep here, you need to be a good swimmer). 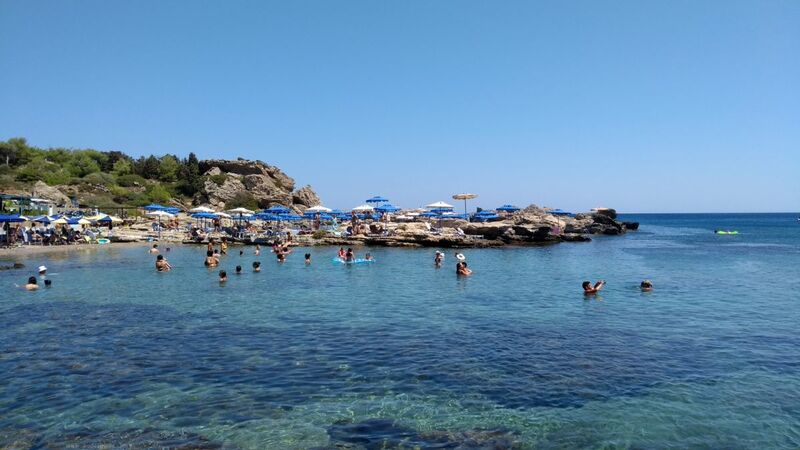 This is the place the locals refer to when they say "let's go for a swim at Kallithea". Each of the little coves has sun beds for hire, and its own small restaurant, which usually lends its name to the beach itself. This is a beautiful place! since the buildings have been restored its even more beautiful! its so tranquill and peaceful. You can go snorkerling for hours! we love it here so much we named our daughter after it! I was there snorkelling and with the crystal clear waters, there is an abundance of amazing marine life, I have many different types of fish, squid, which was a first for me, so, a definate return for me. What a beautiful place. We went Scuba diving with waterhoppers and it was amazing, will do it again this year..